Duchesse de Nemours is the whitest peony we carry. It’s one of the oldest varieties too, as it has been bred more than 150 years ago and enjoys an enduring popularity. Estimated availability levels per week, based on last year’s data. Make sure you get the highest quality peonies and place your order well in advance. Download the Availability Calendar (PDF). Why is it so popular? After all, aren’t there plenty of white peonies available that are both larger and prettier than Duchesse de Nemours? Firstly, the bright white colours of the flowers make her very well suited for a bridal bouquet. Secondly, the flowers are medium-sized which let it combine easily with other peonies. And finally, the flowers have an exquisite fragrance. It’s this unique combination of characteristics that make Duchesse de Nemours wildly popular. Duchesse de Nemours is a full-petalled white peony with globe-shaped flowers that emit a wonderful fragrance. After blooming, the flowers are about 13 to 15 cm wide. This peony variety was bred in 1856 by the French breeder Calot, who inherited a large collection from the Comte de Cussy. He continued this collection until 1872. Other well-known peony varieties bred by Calot are Amabilis, Boule de Neige, Lady Anna, Louis van Houtte, Marie Lemoine, Pecher and Reine Hortense. 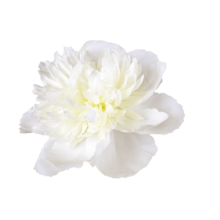 Thanks to its wonderful white colour and fragrance, Duchesse de Nemours is a fantastic peony that is very suitable for a broad range of occasions, like weddings and funerals. Cut the stems diagonally before putting it in a vase and add some Chrysal or sugar to the water.